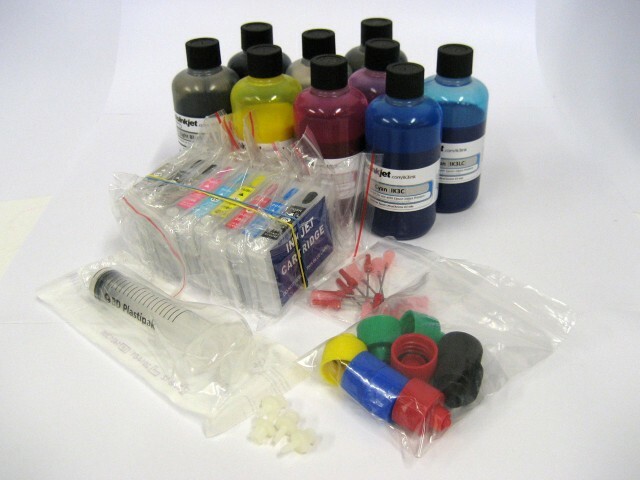 These inks are quickly becoming our preferred brand for the relevant printers. With excellent adhesion, vibrant colours and a reduced tendancy to clog. Some bronzing has been noted with some papers/lighting scenarios but we are now recommending this ink over our existing inksets. This refill bundle now includes a Chip resetter that is compatible with the ARC (Auto Reset Chips) used on the refillable cartridges. This means you can now reduce the amount of waste ink generated from the cartridge change process by removing and refilling/topping-up all your cartridge together, resetting the chips and then replacing them in one go. The printer can then prime the cartridges as one full set and not step through multiple cartridge changes as previously required. The ARCs can now be set manually using the Chip Resetter included with this kit. The chips can still reset automatically when chip decides it is empty as per normal ARC function.